My friend Tamara Sell and her beautiful family spent four years working in New Orleans after Katrina. While they were being of service they learned to love all sorts of New Orleans favorites. I had something like this at her home, scribbled some notes on a piece of paper, stuck it in a pocket, and attempted to replicate it a few weeks later. Spot prawns from Washington or B.C. are green-lighted by the Monterey Bay Aquarium's Seafood Watch list. 1. Thaw prawns if they are frozen by running cold water over them or allowing then to thaw in the refrigerator. 2. Preheat oven to 450 degrees F.
3. Peel and de-vein prawns leaving the tails on. 5. Add garlic until aromatic (don't let it burn!). 6. Add Worcestershire, paprika, oregano, pepper, salt, hot pepper and whiskey and allow mixture to simmer for about 4-5 minutes until it thickens slightly. 7. Add the prawns and stir. 8. Cover the pot and pop it in the oven for about 10 minutes. 9. While that's happening, remove the stems from the chard. Wash by dunking in a sink full of cold water then shake off excess moisture. 10. Stack leaves on top of each other, roll up and cut into 1-inch pieces. 11. In a large skillet, add the remaining tablespoon of butter. 12. When it begins to bubble, add the greens. 13. Keep them moving with tongs until they wilt. Take a taste; should taste tender, not bitter. 14. Remove prawns from oven and transfer prawns to a separate bowl with a slotted spoon. 15. Bring remaining sauce to a low simmer and reduce for about 5 minutes to thicken. 16. 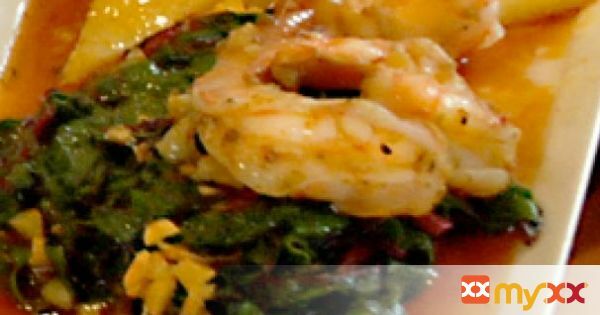 Serve prawns with greens over rice, grits or (my favorite) polenta. 17. Spoon some of the reduced sauce in the pot over the shrimp and greens, and then squeeze lemon over the all for a final touch.